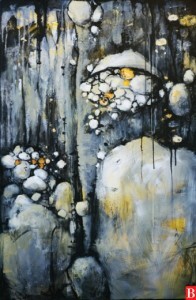 Li’s work is constantly evolving, each phase of life bringing with it new subject matter and artistic technique. Although her work demonstrates an impressive variety of subjects – from figures to cityscapes and organic abstractions – she feels that each stage represents a new phase in her artistic practice as she continually moves forward. 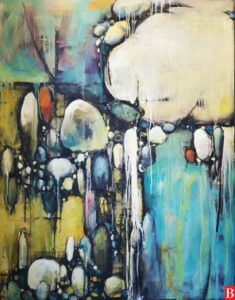 Her current passion is the theme of “beauty and power” through the use of mixed media and dripping techniques. She creates shapes which invoke connotations of beauty and power being in harmony with one another, not in conflict. “Each of my pieces expresses its life, points to a path,” she states. June Li was traditionally trained in art in Guangzhou, China. Being an artist was an unfulfilled dream of her father’s, who could never have a full art practice due to the obligations of having a business and supporting a family. She earned her BFA from Sonoma State University and moved to San Francisco in 2007, where she began to explore more expressive and abstract work. While June is an established graphic designer, her true love is painting. However, what is interesting to explore is the level of professionalism and craftsmanship that seeps into her more creative work in fine art. Although she explores many topics and subjects, she has a style that transcends and expresses itself in each work – making both a varied yet connected body of work, a signature style that always allows Li’s work to be recognizable and stand out from the rest. Li’s artwork is displayed in numerous San Francisco Bay Area public venues and private collections from China, Florence, and London. She is currently available for gallery exhibitions and commissioned pieces.